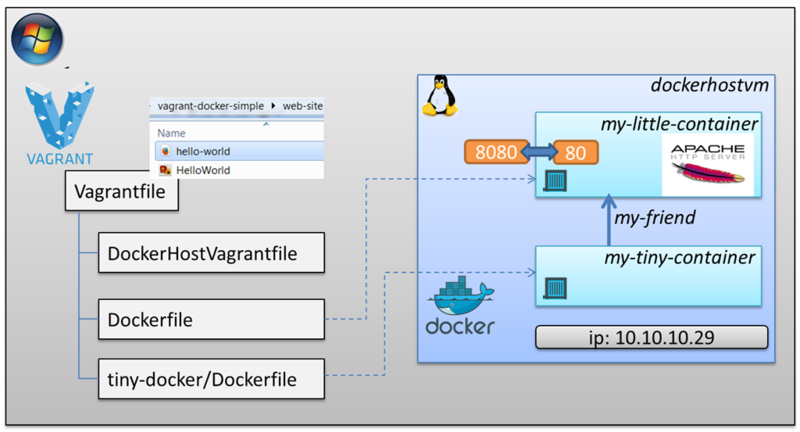 This article is a continuation of the introduction to the combination of Vagrant and Docker that I started here: First steps with provisioning of Docker containers using Vagrant as provider. 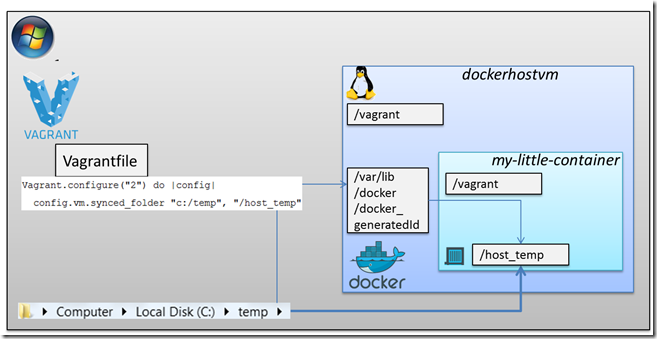 These first steps include how you can leverage Vagrant to create and manage a simple Docker container as well as a Virtual Box Linux VM that provides the Docker engine & infrastructure. Execution of simple Docker files was demonstrated including how to make files from the Windows or Vagrant host available in the Docker build context. We have seen the commands to attach to the running container and look what is going on. We have also seen how we can execute command against the Docker container. In this article, I will discuss more complex challenges including more intricate Docker files that create more interesting Docker containers. I will also discuss more advanced options and operations including the installation of Java, mapping folders into the Docker container (from both the Windows host and the dockerhostvm), using port forwarding to access a service (Apache HTTP Server) running in the Vagrant container from the Windows host, linking containers and using a Data Container to prevent having to create temporary files in the Docker layer structure during the container build process. 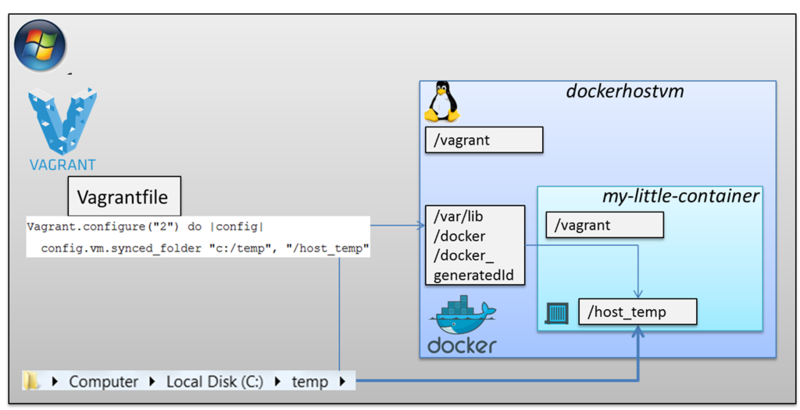 In the combination of Vagrant and Docker as discussed in this article, we have the Docker Container running inside the Linux Docker host that itself is running inside a Virtual Machine on top of the Windows host. Folder mappings between these three components make files mutually available and shareable. 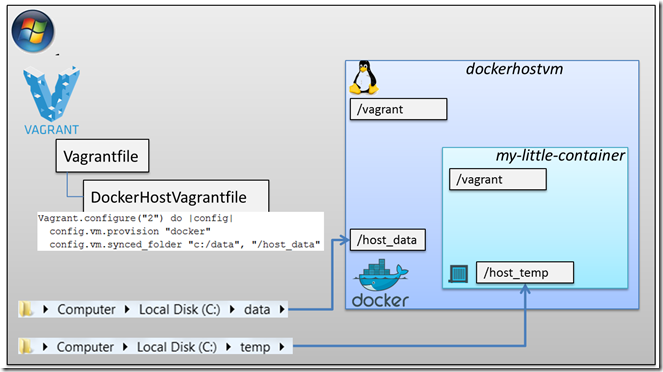 Vagrant can be used to configure the desired folder mappings – in addition to the folder mappings that are available by default. 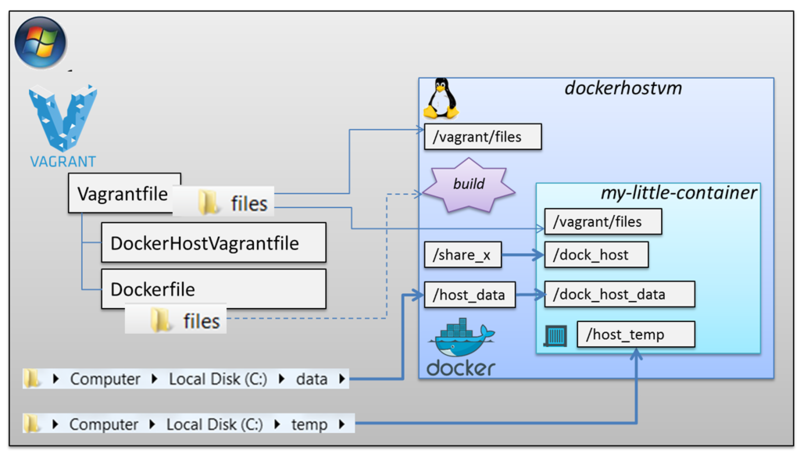 The folder containing the Vagrantfile is automatically available inside the dockerhostvm, mapped to /vagrant. 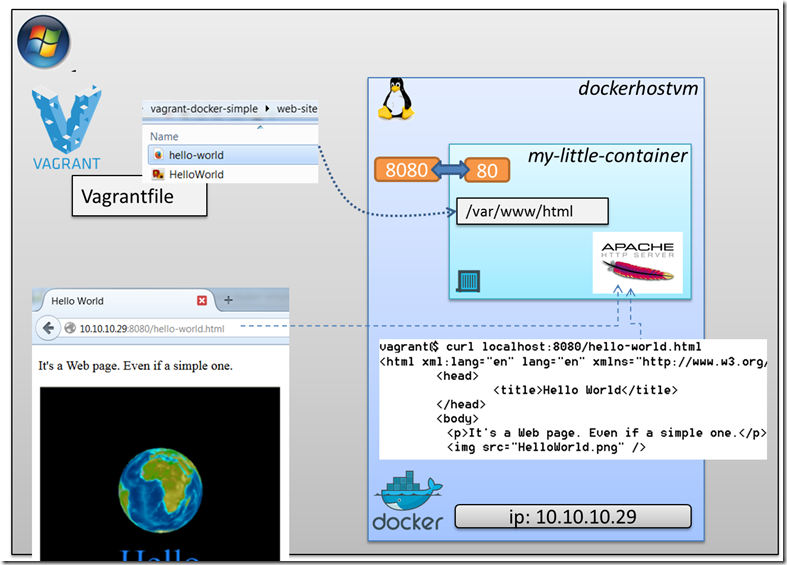 Likewise, this folder is automatically shared with the Docker container as /vagrant. 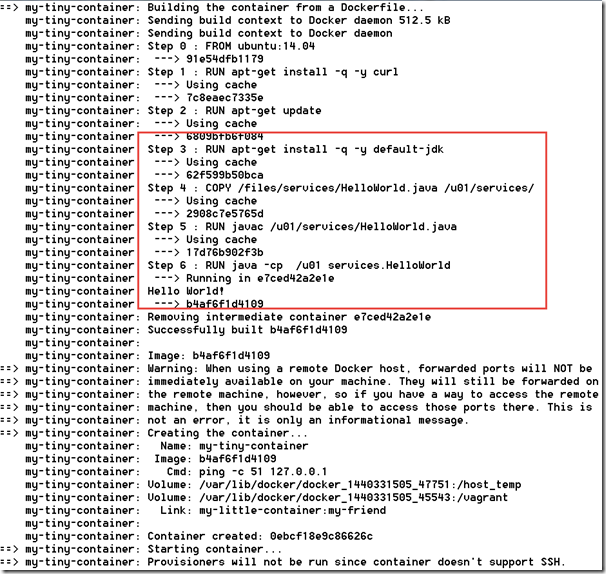 During the build process of the Docker container, all files and folders in the directory that contains the Dockerfile are available in the build context (to copy and otherwise process files from over the course of the container construction). 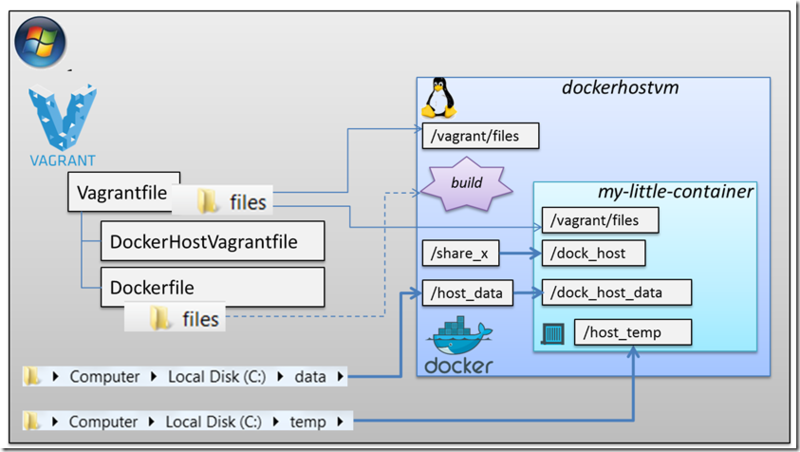 Vagrant implements this mapping in a two step process: first it creates a mapping between the host and the dockerhostvm (with a system-generated name such as /var/lib/docker/docker_1440312061_83042). Next it creates a Docker volume instruction to map this system defined, more or less hidden folder on the dockerhostvm into the Docker container. 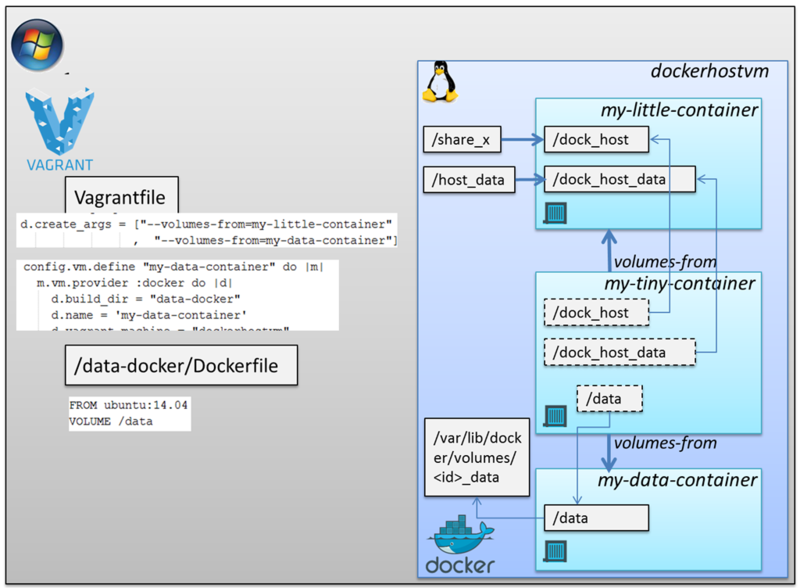 This maps the folder c:\data on the Windows host to the folder /host_data inside the dockerhostvm. to ensure that when the container is started, the /host_data folder in dockerhostvm is mapped into the Docker container as /dock_host_data. This instructs Vagrant to make sure that when starting my-little-container the volume instruction to the Docker engine includes the mapping of /share_x to /dock_host. Docker containers do not persist state. Well, that is not quite correct. But sometimes – due to confusion between images and containers – this may be the impression you get. 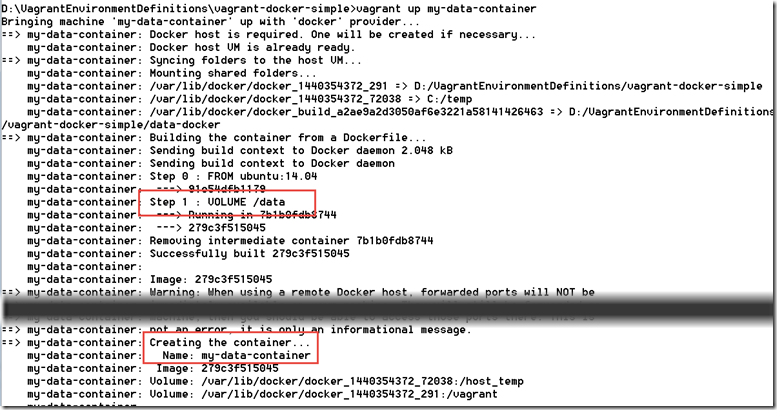 If any files inside the running container are changed, then these changes are not lost when the container is stopped. However, when another container is started from the same starting point, the changes are not part of the second container. When the first container is restarted, then the changes wrought in the earlier session(s) of that container are still around. Only when the container is be committed (resulting in a new image) will the current state be truly preserved and made available to other containers’ sessions. If a container runs an application or service that relies on persistent state – in the form of data, configuration files or anything else that should be available beyond the current session in sessions of other containers – then a way must be found to not have that state inside the container. Options include: using an external file system – mapped into the container as a mounted volume – to write the data, using a linked container (which only shifts the issue, not resolve it), use external services (such as a remote database, Cloud based storage,…) to capture the to be persisted state. We will talk about linking containers and the use of a dedicated data container a little bit later. Let’s first add Apache Http Server into our container – and expose it using port forwarding. What good is a container if we cannot access it. 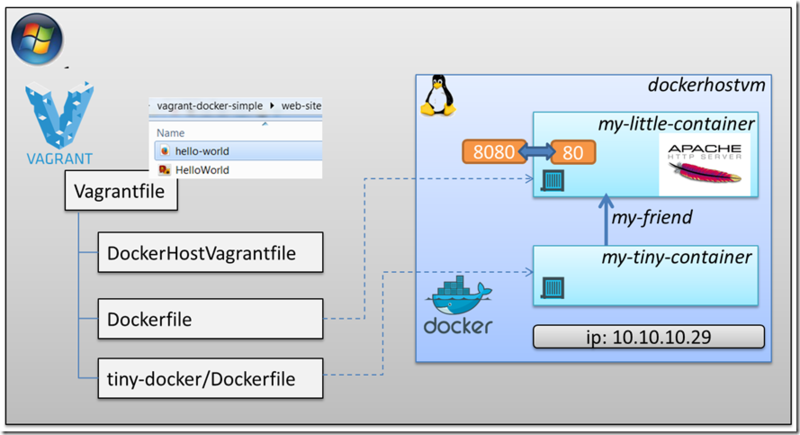 We have seen how from both the Vagrant host and the dockerhostvm we can get into our container to perform activities. However, we have not seen how we can access a running service inside a container. Suppose the container runs a database – then we would like to access it, over JDBC for example. Or let’s assume the container runs a web server – then we would like our browser to be able to access it over HTTP. The container is assigned an IP address, can communicate to the outside world over TCP/IP (and therefore HTTP) – leveraging the networking facilities of Virtual Box that Vagrant has setup for us. We can ping into the container from the dockerhostvm (and supposedly from the Vagrant host as well – however, I did not yet get that to work). Additionally, network ports in the container can be exposed (published) and forwarded to the dockerhostvm. This basically means that accessing http://localhost:6453 on dockerhostvm is processed in the container if a port forwarding was configured from some port in the container to port 6453. We will see next how the Apache HTTP Server is installed into our container and how we can access this server – listening on port 80 – from the dockerhostvm at port 8080 (because of a port forwarding) and from the Vagrant host, as shown in the next figure. In very short: the IP address of the dockerhostvm is assigned by Vagrant based on the network configuration in the DockerHostVagrantfile. The port fowarding between my-little-container and dockerhostvm is defined in the Docker configuration in the Vagrantfile. The IP address of the Docker container is assigned when the container is started (and can be different every time the container starts afresh). The files served by Apache are located in directory /var/www/html on the container (the default for Apache). 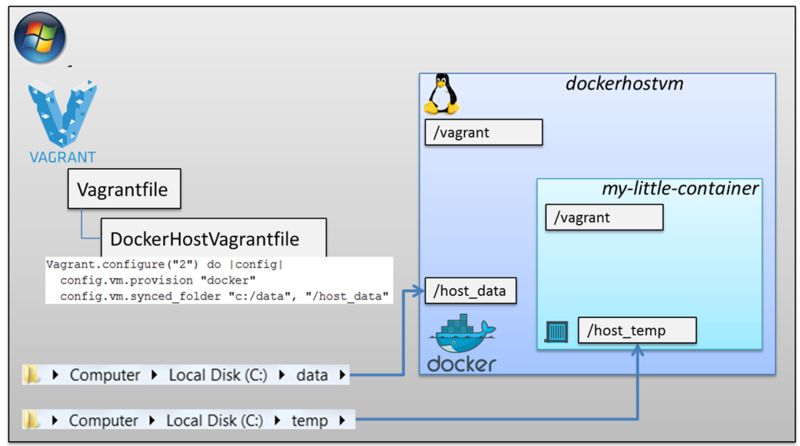 These files were copied from the Vagrant host when the container was built; instructions for this are in the Dockerfile. optionally a CMD instruction could be added to start Apache whenever the container is started (CMD exec /usr/sbin/apache2ctl -D FOREGROUND). Instead, this instruction is configured in the Vagrantfile. The first one ensures that after starting up the container, Apache is started. The second configures the port forwarding between dockerhostvm (port 8080) to my-little-container (port 80). Note: in theory, we should also be able to define port forwarding between Vagrant host and dockerhostvm (using a configuration such as config.vm.network :forwarded_port, host: 8080, guest: 8080). This should allow us to access Apache from the Vagrant host using localhost:8080; however, I have not yet been able to get this to work. The next figure shows the various configurations made and their interdependencies. 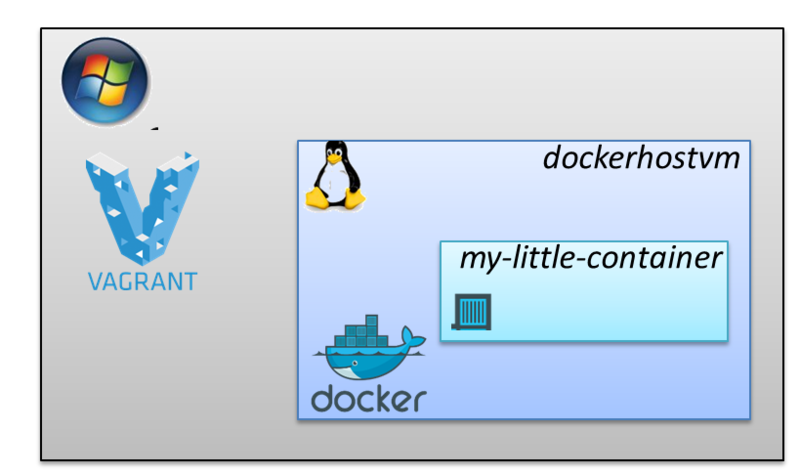 Vagrant can do more than build and manage a single container: it can do the same for multiple containers. And these containers can be linked. This means we can have Vagrant prepare the following situation for us, where we can access the Apache server in my-little-container from my-tiny-container – using the alias my-friend. 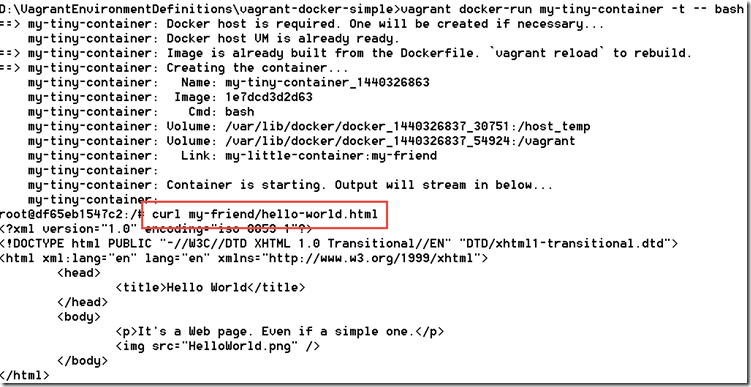 As a result, we can issue the command curl myfriend/hello-world.html in my-tiny-container and receive the contents from the hello-world.html from the Apache server. A few modifications are required for this to work.In Vagrantfile, we define a second virtual machine to be provided/provisioned. This vm – called my-tiny-container – is also provided by the Docker provider using the same dockerhostvm as the Docker host. A child directory called tiny-docker is created under the directory that contains the Vagrantfile. In this directory is a new Dockerfile – that specifies the image to use for my-tiny-container and instructs Docker to install the curl utility. In the Vagrantfile, a link is defined from my-tiny-container to my-little-container, specifying the alias my-friend to be used inside my-tiny-container when referring to my-little-container. 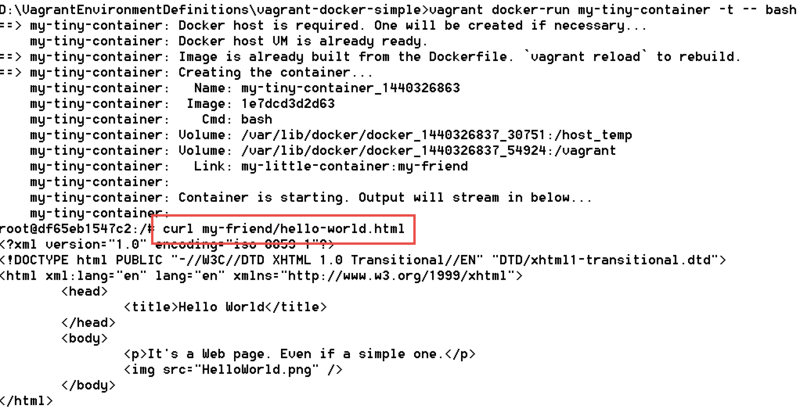 When inside dockerhostvm we can use “curl my-friend/hello-world.html” to access the document hello-world.html served up by Apache server in the companion container my-little-container (that we know under the name my-friend). Note that using ping myfriend we can also get in touch with the linked container. Note: now that the Vagrantfile has to deal with more than one vm, all commands have to be qualified with the name of the vm to which they should apply – my-little-container or my-tiny-container. For example vagrant up my-tiny-container and vagrant docker-run my-tiny-container -t — bash. 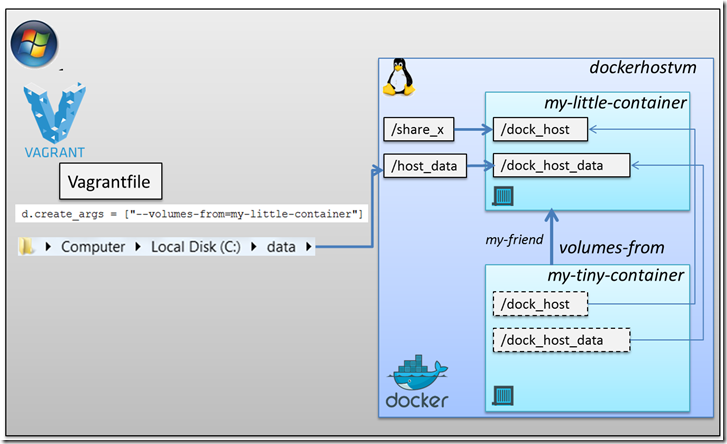 One container can leverage the volumes defined for another container – effectively sharing the same underlying file system area. In this example, we specify for my-tiny-container that it shares the volumes defined for my-little-container. That means specifically that the volumes /dock-host-data en /dock-host that are configured for my-little-container are also accessible inside my-tiny-container. in the configuration for the my-tiny-container vm. Inside the running my-container we can access the volumes from my-little-container – /dock_host and /dock_host_data – just as if they were created directly for my-tiny-container. As discussed above, Docker containers do not persist and share their state (unless explicitly committed as images). They do persist state – but only for their own sake. Other containers will not be able to reuse that state. Vagrant does reuse the same container when you go through a vagrant up – vagrant halt – vagrant up cycle. That means that changes applied to the container in the first session are around in the second, because it uses a different container. 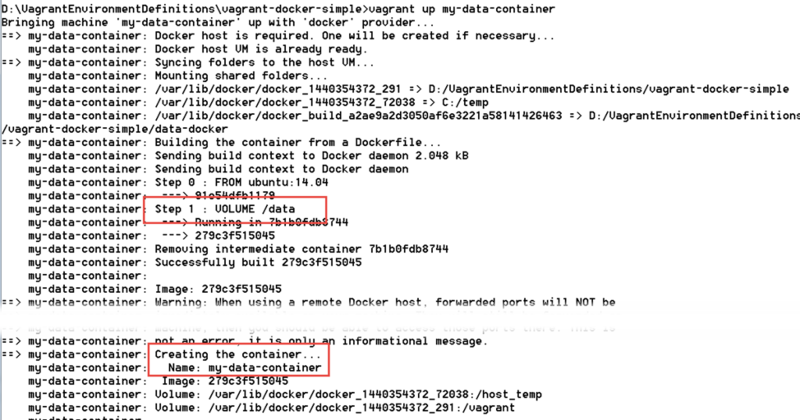 When you perform a vagrant docker-run against a container, you will get a second, distinct container (although based on the same image) that does not have the changes from the other container; also note that this container is immediately removed after the execution is complete. Let me not discuss all details that are very adequately explained by the authors whose articles I have listed below under resources. Let’s just look at an example of using a Data Container. The next figure shows a third container, defined in the Vagrantfile and created and managed by Vagrant just like the previous two. This container is called my-data-container. 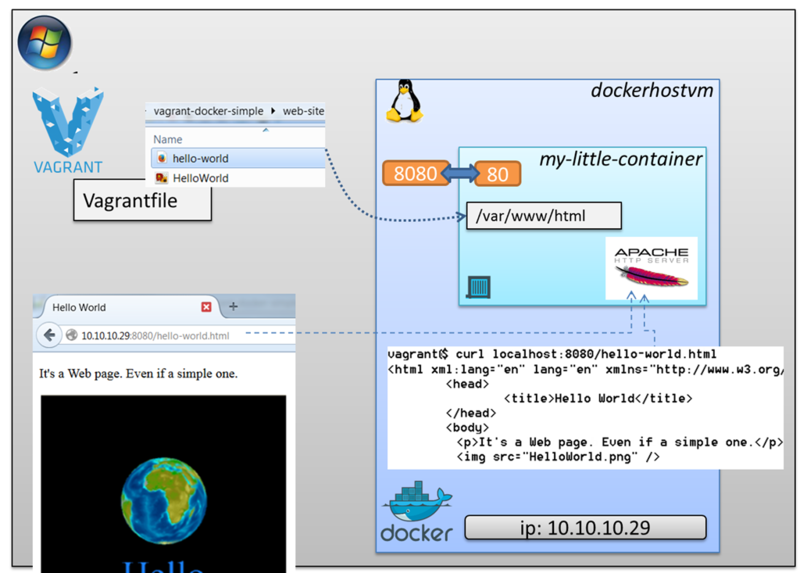 It is built from a very simple Dockerfile that consists of two lines: one to indicate the image – the same image as the other two containers – and a VOLUME instruction. As Adrian Mouat puts is: “volumes are directories (or files) that are outside of the default Union File System and exist as normal directories and files on the host filesystem” Because of the VOLUME instruction, a folder is created in the Docker host – dockerhostvm – under /var/lib/docker/volumes if you must know , but you really should not make use of that information. This folder is mounted in the container as /data. Any change in /data in the container is reflected on the host file system and vv. There is no special indication in the logging of the volumes-from instruction. When we enter into my-tiny-container with vagrant docker-run my-tiny-container -t — bash we can navigate to the directory /data and create a new file using vi readme.txt. 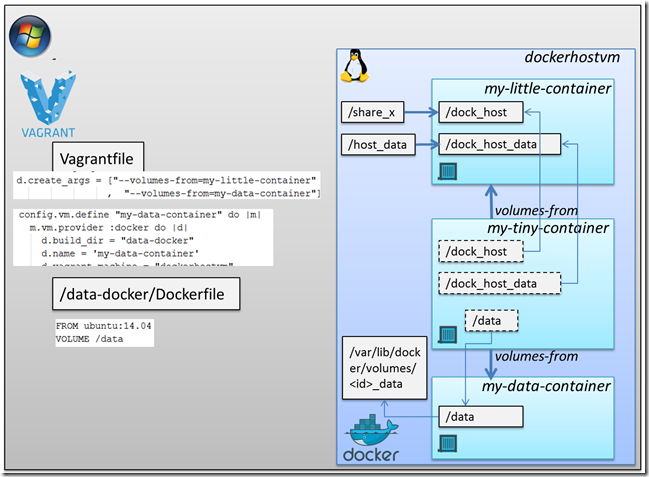 When we then exit the container and start another one, using the same command, we will find that the file readme.txt still lives in /data – which is of course the volume in the my-data-container that is in fact a directory on the file system of dockerhostvm..
Any instance of my-tiny-container will be able to leverage this same volume, over and over again. Note that we can use the volumes-from on other containers as well – and thereby also allow them access to the /data volume in (or rather set up by) the my-data-container. One topic needs to be discussed in a further article: a volume in the my-data-container mapped to a host folder (on the Vagrant host). Is it also available in my-tiny-container that uses the volumes-from on my-data-container? And is the contents from that host-folder also available during the build stage of the container? I believe it is which would mean that installation files, temporary files (result of unzipping installers for example) etc. do not have to be copied into the layers of the container that is being built but instead remain outside of it. That also means that we do not run into the 10 GB size limitation that I ran into before when building containers. 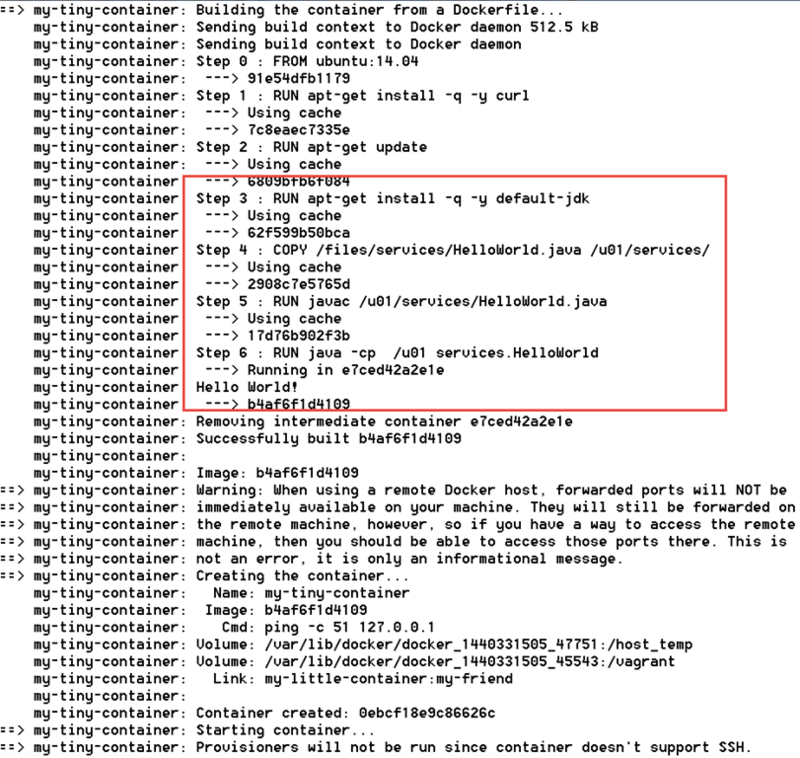 Something almost trivial really – get Java set up in the container. There are many ways of going about this. I will pick a very simple one. The output from class HelloWorld is visible under Step 6, proof that the JDK was installed and could be used to compile and run a Java Class. This article showed how you can leverage somewhat more complex Docker files that create more interesting Docker containers – such as those that are Java or Apache enabled. 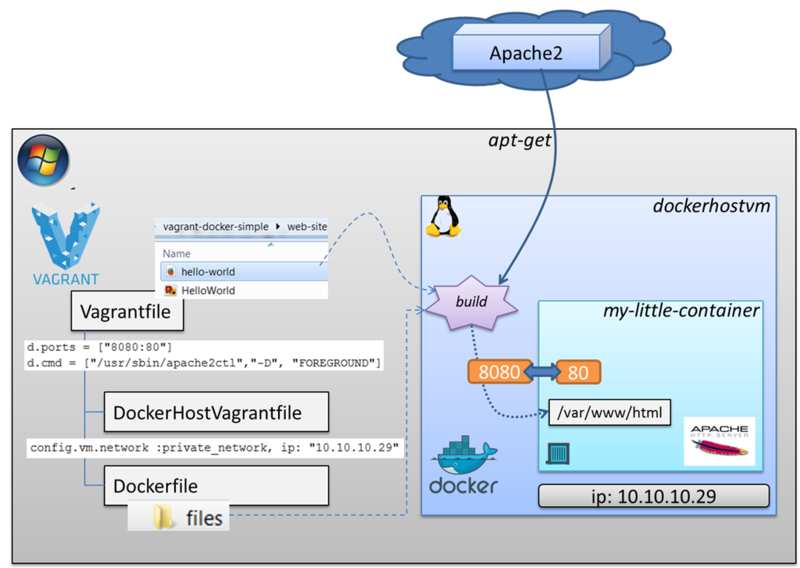 I have shown some advanced options and operations regarding the provisioning of Docker containers from Vagrant, including the installation of Java, mapping folders (from both the Windows host and the dockerhostvm), using port forwarding to access Apache running in the Vagrant container from the Windows host, linking containers and using a Data Container. I needed to set d.remains_running = false inside the data-docker machine. Is this a new thing from vagrant because you did not have to set that? my-little-container: invoke-rc.d: policy-rc.d denied execution of start. Do you have an idea how to solve this please?